Vickers merged with Armstrong Whitworth to become Vickers-Armstrongs, Ltd. Armstrong Whitworth and Vickers produced a whole suite of military products. — acquired Supermarine Aviation Works, which became the Supermarine Aviation Works (Vickers) Ltd and was responsible for producing the historic Spitfire fighter. — the Valentine Infantry Tanks accounted for approximately a quarter of wartime British tank production. Armstrong Whitworth were notable for their artillery, tank, aircraft and shipbuilding manufacturing. 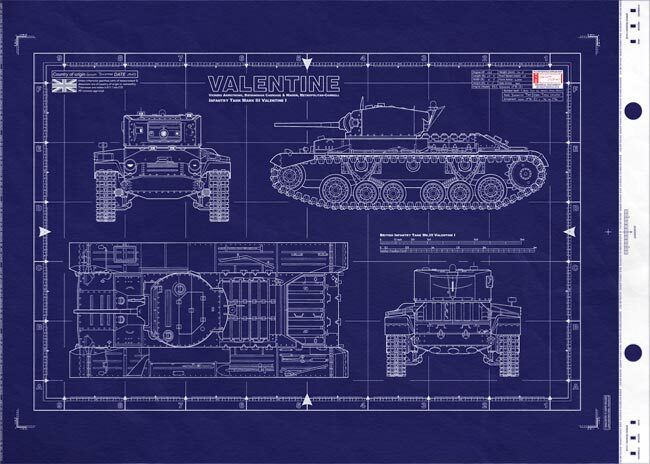 British Infantry Tank Mk.III Valentine Mk.I - This is a real blueprint made directly from vellum masters. Delivered to you on a full size master sheet measuring 42"x 30". The blueprint will arrive uncut, edge not slit, or trimmed, and are marked for proper 36"x24" finishing. 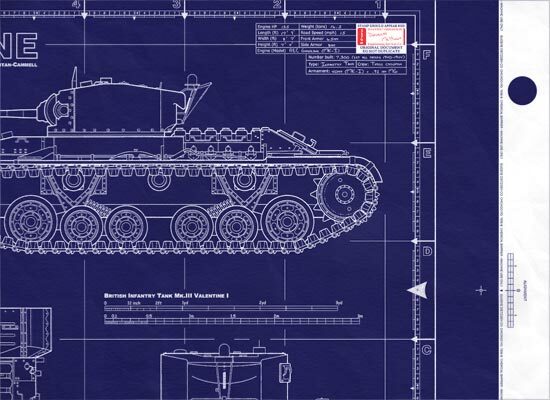 This is a detailed general arrangement plan (standard blueprint cover-sheet) for one of the most successful series of Infantry tanks fielded by Britain in World War II. The blueprint will arrive uncut, edge not slit, or trimmed, and are marked for proper 36"x24" finishing. 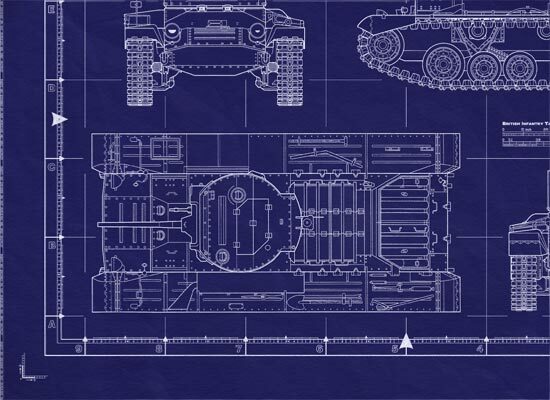 This is a detailed general arrangement plan ( standard blueprint cover-sheet ) for one of the most successful series of Infantry tanks fielded by Britain in World War II. Continued from above… being the most numerous tank designed and produced in Britain in WWII, and the only British tank that was in service throughout the whole period of the war. The Valentine tank was officially known as British Infantry Tank Mark III. Having had its baptism of fire in Operation Crusader, in November 1941, North Africa. It was extensively used in the Western Desert Campaign and were a staple of fighting thereafter. The last British infantry tank to enter production before WWII was the Infantry Tank Mark III Valentine. Several versions exist concerning the source of the name "Valentine"... Some say it took its name from the fact that Vickers submitted the design to the War Office just prior to St. Valentine?s Day in February 1938. Other Historians suggest the name may also have been paying homage to Sir John Valentine Carden who was a designer of many of the tanks that came before the Valentine. Perhaps the most popular one says that the design was presented to the War Office on St. Valentine's Day, 14 February 1940. The Infantry Tank Mk III Valentine saw service from 1941 to the end of the war. It was used in North Africa, in Western Europe, the Pacific and on the Eastern Front as part of the Lend-Lease program. The chief objection to the new design was the small turret, with space for two men. In June 1939, however, as war loomed, the government placed an order for 275 Valentines without even a prototype. The first tank was delivered in May 1940. Because of a shortage of cruiser tanks, Valentines served in that role in British armored divisions. There were 11 different Marks and some variants that were used for special purposes. Variants of the Valentine Infantry Tank included self-propelled guns, a bridge-layer, a minesweeper and a flamethrower. There was also an amphibious version of the tank. The first Valentines had riveted construction and used gasoline as a power source. Later versions had welded construction and used diesel. At first, these tanks had AEC engines, gasoline and then diesel. Later on, Valentines were fitted with GMC two-stroke diesel engines. The earliest models had a 2 pounder gun as the main armament. Intermediate versions had a 6 pounder gun. The final model had a 2.95 inch (75mm) gun. The Valentine was undoubtedly one of the most important British tanks, but the main reason for this was quantity rather than quality. During one period in 1943 one quarter of all British tank production was of Valentines, Valentines were also produced in Canada. The bulk of the Canadian output was sent to the Soviet Union, where the type appears to have given good service. The Valentine did have its drawbacks, but overall its main contribution was that it was available in quantity at a time when it was most needed. Considered one of the more successful British tank designs of the early war years, the Valentine series served both British and Soviet forces effectively. British forces first fielded the system in Operation Crusader, in which forces were sent to relieve their comrades at beleaguered Tobruk. The Valentine would prove its effectiveness as an infantry tank throughout Africa and in the jungles of Burma as well, showing up Japanese armor in the process. Some of the British Valentine tanks started to equip the army?s cavalry units to compensate for the losses suffered at Dunkirk, and only after they appeared in the armored brigades, where they began to perform their usual role of infantry support. It was extensively used in the Western Desert Campaign and were a staple of fighting thereafter. The basic Valentine tank was extensively modified throughout its operational career, but it remained throughout reliable and sturdy. At one point the Valentine was the British army's most important tank. It was used by many Allied armies such as that of New Zealand, and many saw action in Burma. This light infantry tank had its baptism of fire in Operation Crusader, in November 1941, North Africa. It was in North Africa where it was fitted with extra fuel tanks to increase its range. Although it earned a reputation as a mechanically reliable and well-protected armored vehicle, the Infantry Tank Mk III shared the common weakness of the British tanks of the period, which was the lack of high-explosive capability of its gun, and soon became outdated as an anti-tank weapon. By 1944 the Valentine was almost completely replaced in front-line units of the European Theatre by the Infantry Tank IV Churchill and the US-made Sherman. The only British tank that was in service throughout the whole period of the war. The Valentine was a light infantry tank of the Second World War developed by Vickers-Armstrong for the British Army. It entered service in 1940 and was used in military operations in North Africa and Europe, being partially replaced by Infantry Tank IV Churchill. The driver was located in the middle in the Valentine. He steered by using a skid type operation with clutches and brakes. These were linked to the rear of the Valentine. There was a hatch above the driver for entry and exit, which contained two episcopes and a small visor. There was an exit below the driver's seat. The commander only had an episcope to look out of when the hatch was closed. He sat on the right in the turret and also acted as the loader. The gunner was on the left and used his shoulder to elevate the gun. The Valentine's turret was made from cast pieces, front and rear, that were riveted to rolled side plates. 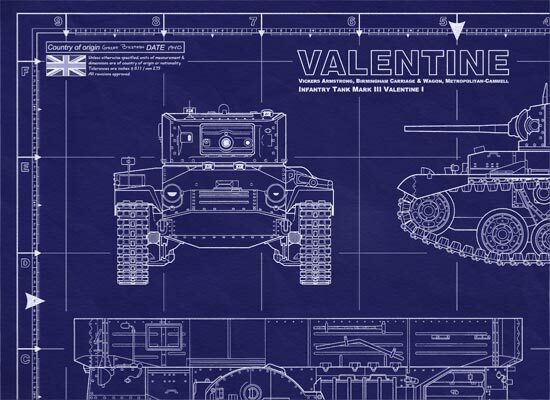 The first Valentine tanks were built using riveted steel plates, but they were later manufactured with welded plates. The Valentine's sides were two plates, riveted together, that were joined in the middle. Screwed onto these were the top plates. Later production used riveting for joining the top and bottom plates. The nose and rear plates were riveted to iron stiffeners. There were bulkheads separating the engine and driving compartments from the fighting compartment. The bogies were mounted in pairs on each side with 3 wheels each. The front and rear wheels were 24" in diameter and the inside sets were 19.5". The idler was in the front, while the drive socket at the rear. Behind the rear bulkhead was the engine, gearbox, and transmission. Through multi-plate steering clutches and a reduction gear mounted on the hull side the power was sent to the drive sprocket. It was used in North Africa, in Western Europe, the Pacific and on the Eastern Front as part of the Lend-Lease program. The Valentine's chassis was also used for the Archer tank destroyer and the Bishop self-propelled gun.